Lake Marian in Fiordland National Park. In New Zealand there are 3,820 lakes with a surface area larger than one hectare. The lakes are of varying types and origins. Many of the lakes in the central North Island area are volcanic crater lakes, while the majority of the lakes near the Southern Alps were carved by glaciers. Hydroelectric reservoirs are common in South Canterbury, Central Otago and along the Waikato River. 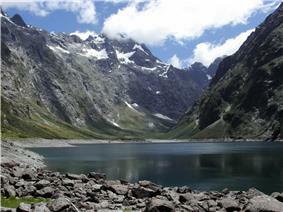 A trophic level index is used as a measure of the pollution levels of lakes in New Zealand. Based on the monitoring of 134 lakes it is estimated that one third of New Zealand lakes have high nutrient levels or have poor water quality. ^ Nathan, Simon.Types of lake (map), Te Ara – the Encyclopedia of New Zealand, updated 2007-11-05. Accessed 19 December 2007. McGeorge, Pamela (2007). A land of water : rivers & lakes of New Zealand. Auckland, NZ: David Batement. Verburg, P.; Hamill, K.; Unwin, M.; Abell, J. (August 2010). Lake water quality in New Zealand 2010: Status and trends (PDF). Hamilton: National Institute of Water & Atmospheric Research Ltd.
Hamill, Keith (November 2006). Snapshot of Lake Water Quality in New Zealand (PDF). ME 776. Ministry for the Environment.